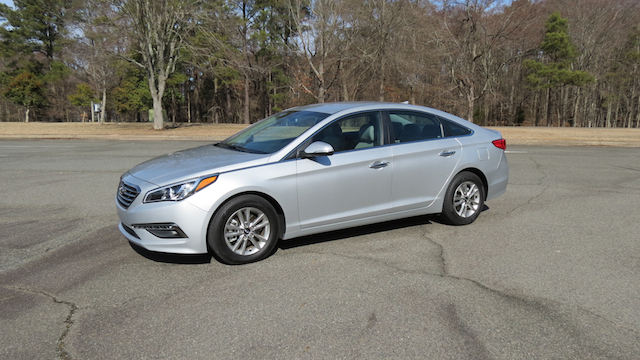 Hyundai continues to expand its Sonata line. For 2015, six editions are available, including an all-new Eco model. The Sonata Eco fuses power with efficiency, delivering the best amalgamation of the two across the model line. Some manufacturers aren’t satisfied with us media folk driving just one edition of a particular make and model. Hyundai, for example, has shared multiple variations on its Sonata theme with yours truly, including Limited, Sport 2.0T and most recently an Eco edition. Hyundai’s popular midsize sedan is now sold in six trim levels ranging from the $21,150 Sonata SE to the $33,525 Limited 2.0T. That’s quite a price span, but a well equipped model can be had for about $28,000 or about $2,000 under the price of what comparably equipped cars from its competitors are offering. The latest edition in this front-wheel drive sedan’s arsenal was dropped off on a blustery February afternoon and stayed with me for an extra week as our local area turned into a skating rink. No problem, I managed to drive the 2015 Hyundai Sonata Eco on the days that were ice free to adequately assess this vehicle. I won’t rehash all the design particulars and the many amenities of this model. Instead, I invite my readers to peruse my review of the Limited edition, published on this site last August. 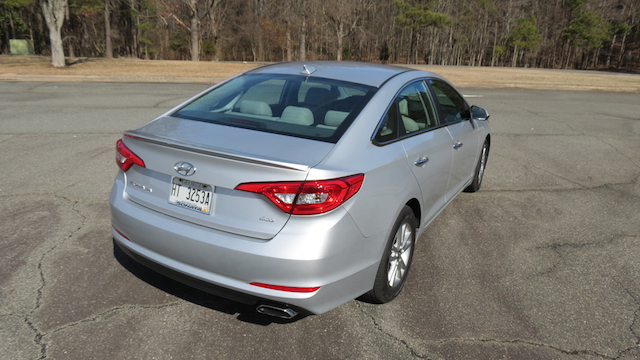 Please see: 2015 Hyundai Sonata Raises the Bar Again. What I will concentrate on here is the Eco’s powertrain system, unique to this model. That powertrain is composed of two main ingredients: a 1.6-liter turbocharged four-cylinder gasoline engine and a 7-speed dual clutch transmission. 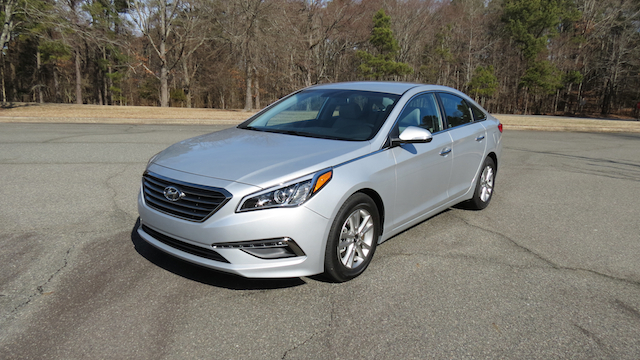 Truly, it is an amalgamation that provides optimum fuel economy for the Sonata, coming in at 28 mpg in the city and 38 mpg on the highway for a combined 32 mpg. My fuel numbers averaged slightly below average, coming in at 29.6 mpg. Notably, I attributed that more ordinary figure to two issues that were at hand: 1), unusually cold weather in my region and 2), mostly local driving. In any case, achieving 30 mpg for a car of the Sonata’s size is an impressive feat. Comparatively, the standard Sonata outfitted with a 2.4-liter normally aspirated four-cylinder engine makes 185 horsepower and achieves 25 mpg in the city and 37 mpg on the highway. On the other hand, the Sport 2.0T produces 245 horsepower with is twin-scroll turbocharged four-cylinder engine and achieves 21 mpg in the city and 31 mpg on the highway. The latter numbers are equivalent to what today’s small block normally aspirated V-6 engines deliver. The salient point for the Sonata Eco is that Hyundai took a small four-cylinder gasoline direct injection engine and added a turbocharger to enhance power and fuel economy. 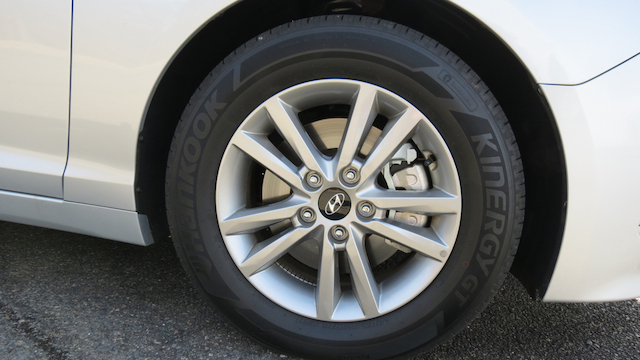 But that engine does not do it alone — Hyundai’s electronically actuated gear changing dual clutch transmission does a commendable job too, quickly shifting between gear points. For optimum shifts between gear points you can operate the stick manually. Sorry, no paddle shifters are present. Like nearly every turbo out there, this one shines best once you get going. From a stop, you will experience some hesitation as power lags acceleration, but only very briefly. Once boost is attained you will enjoy the full benefit. Moreover, you will have an engine that operates quietly and smoothly. For some drivers, a turbocharger isn’t enough. Indeed, they want to control the driving mode, something Hyundai makes possible via Sport mode. Here, the transmission shift points come in at a higher RPM, but your fuel economy would suffer. Then again, that may be a worthwhile exchange for optimal performance. But do not think that in the Sonata Eco you are getting the equivalent of a road beast with this model. You are not. The Sonata Eco has the same suspension system as the standard model and it lacks the rack-mounted, electric power steering assist found in the Sport 2.0T. Even so, not one Sonata model delivers jaw-dropping driving excitement, so you are not missing out — you can blame front-wheel drive and the family-friendly midsize segment for those omissions. If you want unabashed sporting fun, the Genesis Coupe may be more to your liking. Now back to the model at hand. Specifically, the engine. 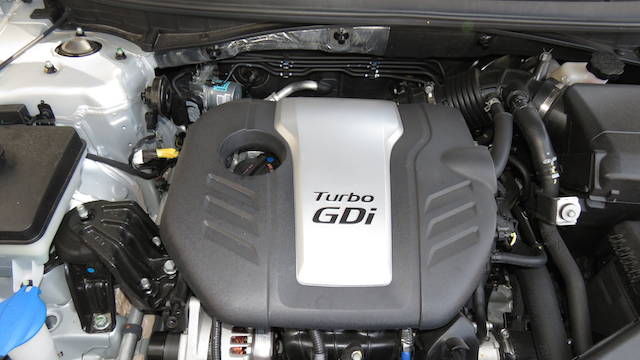 Some readers may note that this engine first found its way under the hood of the Veloster turbo. Indeed, it had. However, it has since been modified with new intake runners to reduce weight, an electric wastegate installed for improved boost, a higher compression ratio present and a low-friction roller used to meliorate fuel economy. As for the Sonata Eco edition itself, it is priced from $23,275 or toward the lower end of the model’s pricing spectrum. The test model had a $28,310 sticker price, owing mostly to a $4,100 tech package. 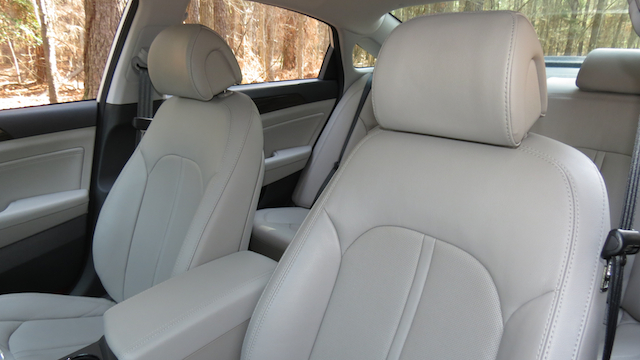 That package brought in an assortment of amenities, including blind spot detection, a hands-free smart trunk opener, leather-appointed seats, heated front seats, a navigation system, SiriusXM satellite radio and an upgraded audio system. Opting for the Eco may be the best choice for the individual who desires a bit more power on the road and the enhanced fuel economy that goes with it. 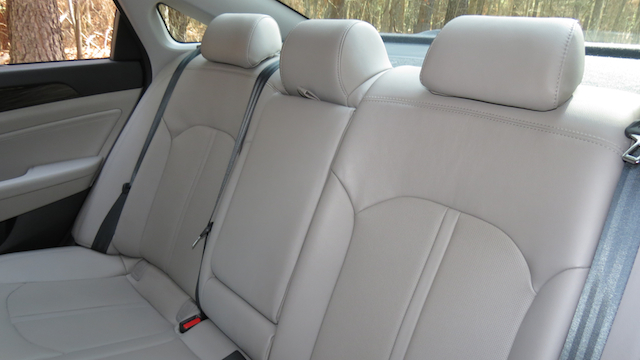 Its low price point makes it an inviting option as it is priced only $100 more than the Sonata Sport. Thus, you get a different powertrain minus the standard heated seats found in the Sport edition, providing a compelling reason for anyone to consider the Sonata Eco. 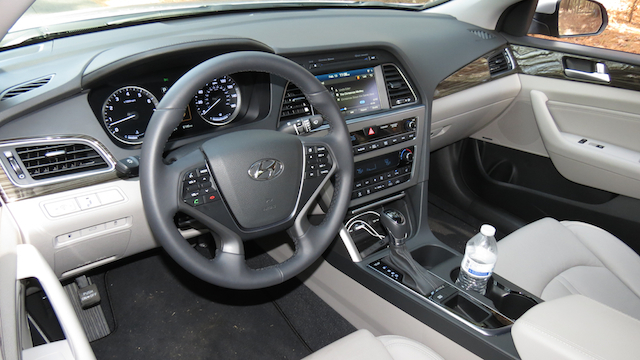 2015 Hyundai Sonata Eco photos copyright Auto Trends Magazine.